1. Starting off with a journalistic hard-hitter... How many Sprinkles and "Cupcake War" cupcakes would you estimate you eat a year? CN: Usually I eat one Sprinkles Cupcake each day, except during store openings when I take my quality control seriously and I taste all day long. When filming “Cupcake Wars,” I taste 13 cupcakes for every single episode! With the 26 episodes we filmed in the past year, I suppose that would bring my year to date cupcake tally to 703! 2. You recently opened your first Sprinkles in New York. What was that like - finally opening in the same city as your long-perceived rival, Magnolia Bakery? And what has the reception been for 'LA cupcakes' in NYC? CN: Sprinkles New York is off to a great start. New York has a very well established cupcake scene which inspires us to bake and be our best everyday. However, in spite of all the bakeries in NYC, I believe Sprinkles offers something unique. 3. 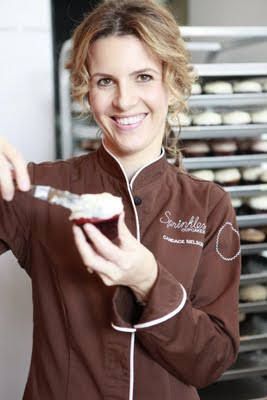 Are there any non-Sprinkles cupcakes you like in Los Angeles? CN: Yes, I opened a cupcake bakery because I love all kinds of cupcakes! There are some great bakeries in the area and I admire the ones that use high quality ingredients and bake fresh daily. Joan’s on Third makes delicious cupcakes! 4. Can dudes eat cupcakes comfortably? For example, I like the Chai Latte. A CHAI LATTE CUPCAKE. Can I look myself in the mirror with confidence (if I happen to remember which day you guys have Chai Latte - I always forget)? CN: Yes, Mike, you can come into our bakery every Friday and enjoy a Chai Latte comfortably. We purposefully designed our store and product to spotlight the ingredients and handcrafted nature of our cupcakes rather than embellishing it with doilies and flowers. Our minimal design means you can leave still feeling like a man! 5. On a serious note, have you ever met anyone stupid enough not to like cupcakes? If so, what would you say to such a person? CN: I occasionally come across people who say cupcakes aren’t for them, but this usually stems from a lack of sweet tooth (i'm convinced it's a missing gene). I am usually able to win them over with one of our less sweet cupcakes like cinnamon sugar (no frosting) or chocolate marshmallow! More commonly, people can’t eat our cupcakes for dietary reasons which inspired me to begin offering gluten free and vegan cupcakes. I’m currently working on a sugar-free option as well! I really need to try their Salted Caramel before it goes away!